The Ventura County Chapter of the Surfrider Foundation has been working for over 15 years to help plan the restoration of Surfers' Point. This world class surf break was once in danger of being compromised by a seawall, and will soon be the site of an innovative 'Managed Shoreline Retreat' project. If you were on the Promenade this weekend you probably saw the sign announcing the upcoming repair work. Surfrider had commented on this issue as far back as 2001, and it's taken the city this long to come up with the funding to do a partial fix of the aging seawall. Our concerns have been that the addition of rock will narrow the beach, and make it more hazardous. Apart from the decaying concrete, one of the biggest maintenance problems for the city has been the stairs in the 'cove.' These are the ones we all use to get in and out of the water, and they take a beating at high tide. The biggest change will be the removal of these stairs, to be replaced 150 ft down the beach. They will be made of timber, and set back from the beach to help resist the regular poundings from high surf. Last week the Matilija Coalition received a letter from Ventura County in response to our February 16, 2010 position statement that outlined concerns with the proposal to attempt to permanently store the fine sediments from Matilija reservoir within the floodplain upstream of the dam. The County's response was also directed towards a long letter from the Environmental Defense Center that provided a detailed analysis of potential increased impacts and the need for additional environmental review – including, for example, that the Upstream Storage Area proposal would create several permanent threats and impacts that were not previously evaluated. The County's letter emphasizes the need for consensus, and describes a process to renew the dialog with Matilija project stakeholders. The letter concludes with "As always, I look forward to receiving any ideas you may have on alternatives to consider as we kick off our facilitation effort." 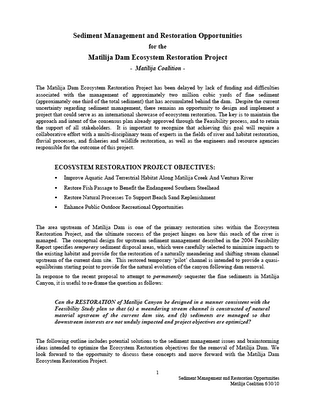 In our response, we reiterate our commitment to ecosystem restoration, and offer a 4-page document titled "Sediment Management and Restoration Opportunities for the Matilija Dam Ecosystem Restoration Project" We believe there are ways to resolve the sediment management problem that are compatible with the goals of ecosystem restoration. Thanks to everyone who came out for Hands Across the Sand on Saturday! Waving signs and chanting for a ban on offshore drilling, about 200 protestors flocked to the beach next to the Ventura Pier on Saturday. ... The gathering was part of Hands Across the Sand, an international demonstration at more than 700 beaches around the world.